Calvin Klein’s Major LA Purchase! Fashion designer Calvin Klein views a new home as “a blank canvas that I can make my own,” he says. So he’s eager to unleash his creative energies on the contemporary five-bedroom home in Los Angeles that he has just purchased for $25 million. The huge deal that closed Tuesday for a newly built home on Tanager Way in the Bird Streets area of the Hollywood Hills. 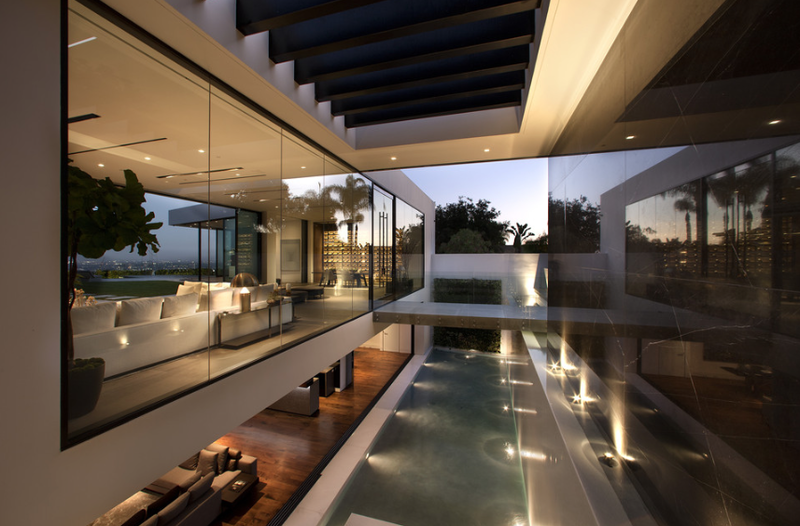 The home measures out at about 9,300 square feet, has automated retractable floor-to-ceiling glass walls that open to a grassy lawn, and an infinity pool with views of downtown Los Angeles and the Pacific Ocean. Mr. Klein, who was house hunting in the Los Angeles for more than a year, said the view was a major factor that drew him to the house. He added that his search centered primarily around contemporary homes. “I knew I wanted to end up with something that had a lot of glass.” The entryway o the house features a bridge over a waterfall and reflecting pool. The home also has an eight-car-garage, a screening room and a temperature-controlled wine room off the dining room. Mr. Klein said he will make some changes to the house, but “it doesn’t need a lot of renovation.” Mostly, he’s excited to start furnishing the home. He loves architecture and interior design and it all connects to the work he’s done as a fashion designer.